My Blessed Miracle “Mikey” is almost 3 years old. He was born at 37 weeks with an omphalocele, a type of hernia. After my C-section, he was rushed to Akron Children’s Hospital. He stayed in the NICU for two weeks. A week after he was born, Dr. Pittinger performed major abdominal surgery to push back my son’s organs. A week later my son went home. 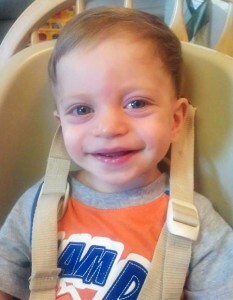 Today Mikey is a healthy, vibrant 2-year-old. I thank the NICU nurses and Dr. Pittinger for taking such good care of my baby boy. I am so grateful!